A few weeks ago Steve and I headed down to Monte Carlo to see the semi final day of the tennis masters. After significant googling, I realised that any hotels in Monte Carlo are either a) more expensive than rent per night or b) a bit crap and super far out of the centre. 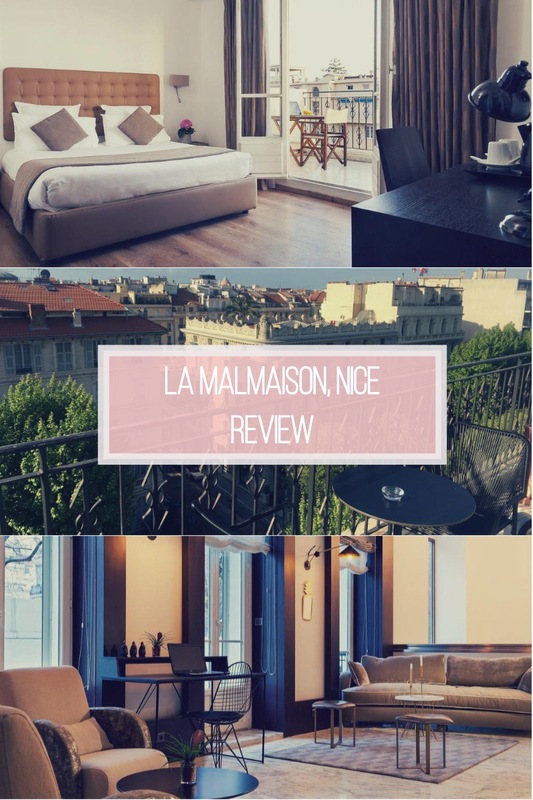 With neither of those options appealing to me massively, one of my friends suggested staying in nearby Nice and then hopping on the train over to Monte Carlo during the day, which seemed like a great option and hence I stumbled across La Malmaison Hotel, a retro style boutique hotel in the heart of the city. Found just a couple of roads behind the famous Promenade des Anglais on boulevard Victor Hugo, La Malmaison Nice is just a 5 minute walk from the Gare de Nice-Ville, ideal if you are exploring more parts of the Côte d’Azur. It is also just a 15 minute walk away from the main sights including Vieux Nice (Old Town) and Port Lympia. 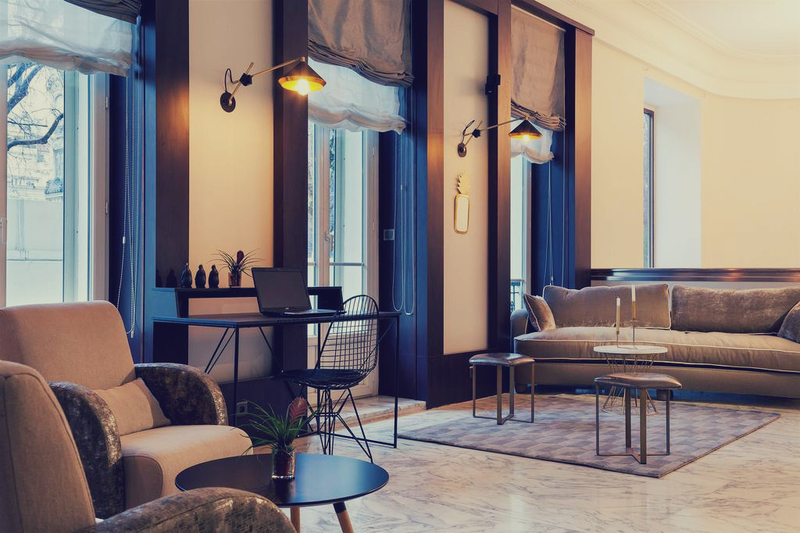 In February last year, La Malmaison Nice was completely renovated by local interior designer Emmanuelle Boero and given a whole new look and it now boasts a very on trend art deco style throughout (think marble floors and copper accents). Influenced by the 1920s, this gives the hotel a lavish but contemporary feel, which I loved as soon as I stepped through the door. La Malmaison Nice hotel rooms are kitted out in a similar Great Gatsby inspired style with all the essentials including a great added extra of an on demand service with over 100 movies to choose from free of charge – a nice little luxury if you want to chill out after a day’s sightseeing. One slight negative was that there was no shower in our room, other than a bath shower. 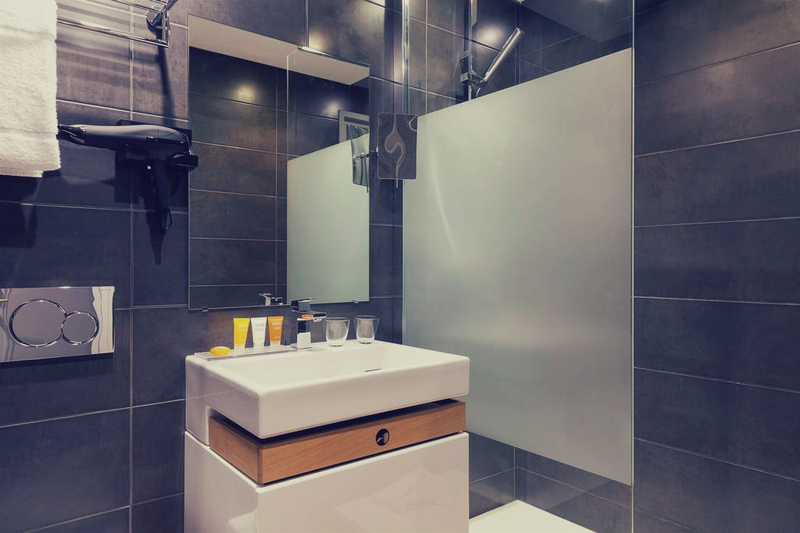 From looking on the website that doesn’t seem to be the case in all the rooms, but if you are a shower lover like me you might want to request a room with a separate shower too! They only serve breakfast at the hotel and on offer is the continental spread you would expect along with hot options of bacon and scrambled egg. There’s nothing ground-breaking on the menu but for a fuss free start to the day it does the job. 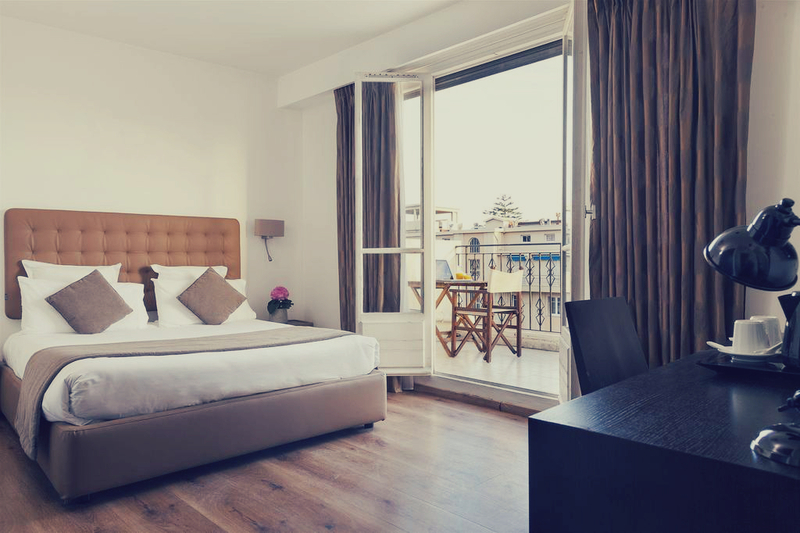 If you upgrade to an executive room or higher you will also get your own super cute terrace outside which overlooks the very french looking streets below. We took full advantage of ours by ordering room service breakfast and eating it al fresco! 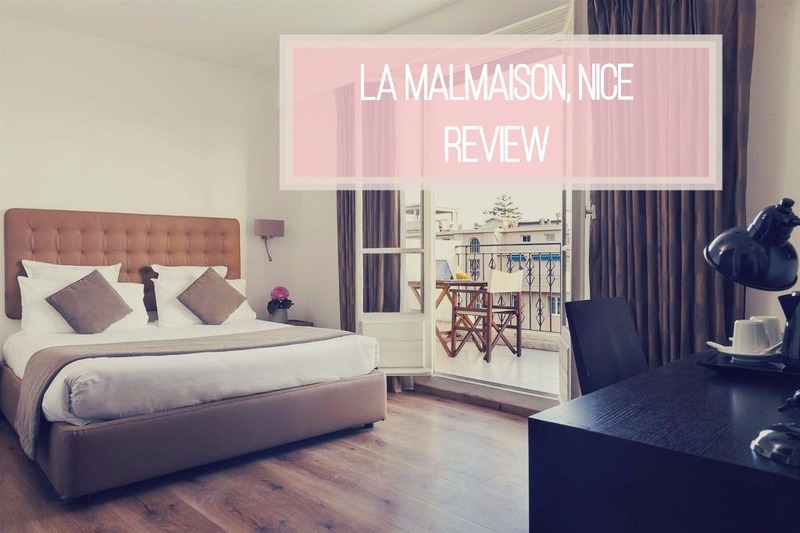 Service wise, I was really impressed with the team at the La Malmaison Nice – we had an early flight and so arrived at the hotel by about 11am. Check in time wasn’t until 3pm and so the room we had been allocated wasn’t ready but noticing our slightly knackered and definitely not hungover (whoops) faces the lady who was organising our check-in moved some rooms around so we could get in our room for a midday nap within half an hour. If you are looking for a stylish and modern base to explore the French Riveria that doesn’t break the bank, you should certainly give this one a look. Next Post Sheraton Grand Park Lane’s Jazz Afternoon Tea In London: Review + Giveaway!